So I made this sweet little hat for my daughter out of 2 balls of the Old Rose colorway. 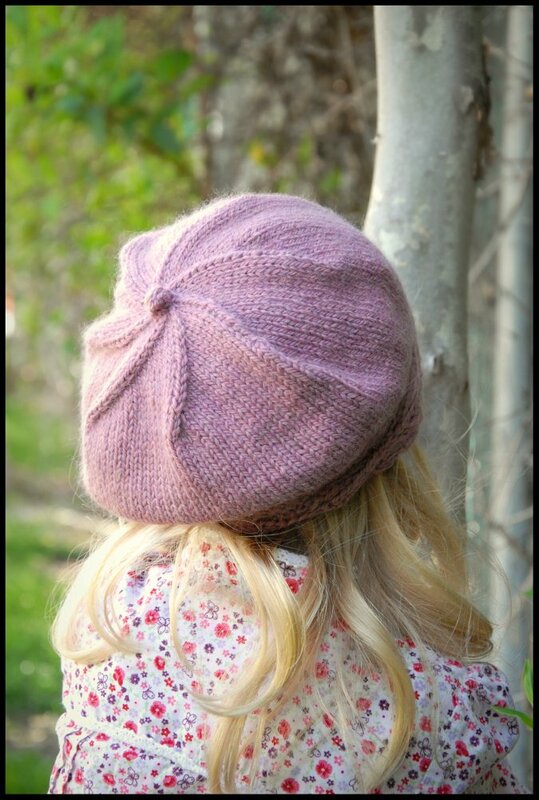 The pattern is the Dindy Beret by Kate Oates of TotToppers. What a cute little hat this is. The leafy border is such a nice detail. I made a few modifications for my daughter's version. 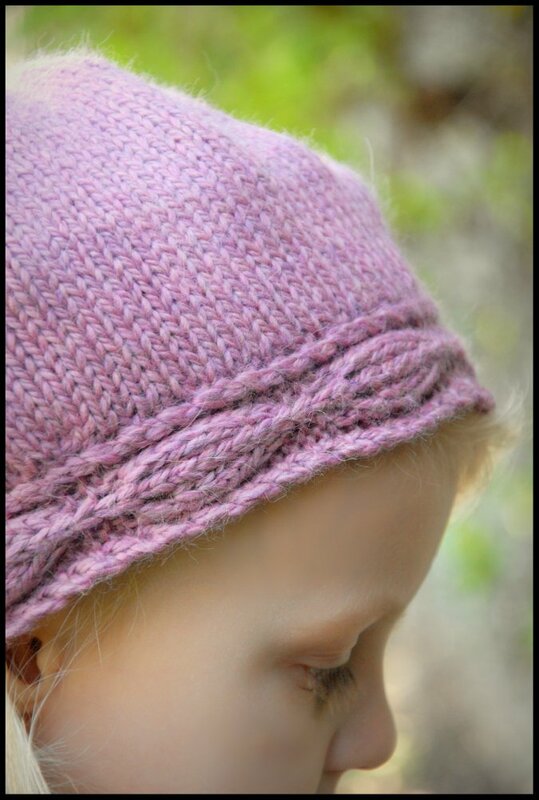 The pattern calls for 2 adorable body styles, but I chose to leave her hat plain on the top. Also I knit the leafy band with a size 7 needle, and the body in a size 8 which created a slightly slouchier look. 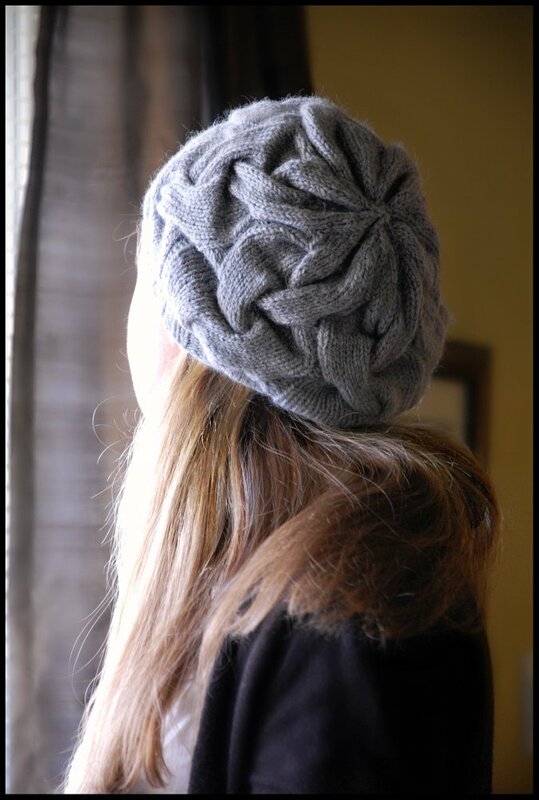 I love the swirly decrease pattern and the bobble on top. The small little details really add to the design. If you like this hat, check out Kate's blog here. 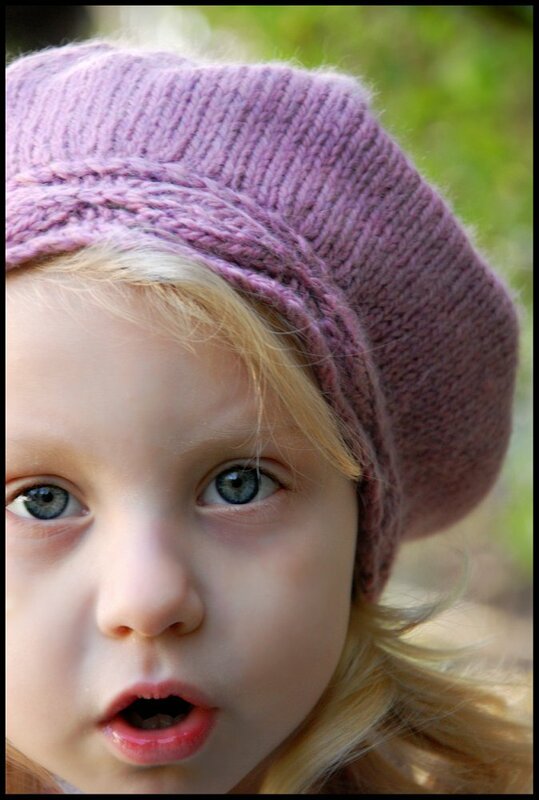 She has a ton of great hat designs for adults and children. 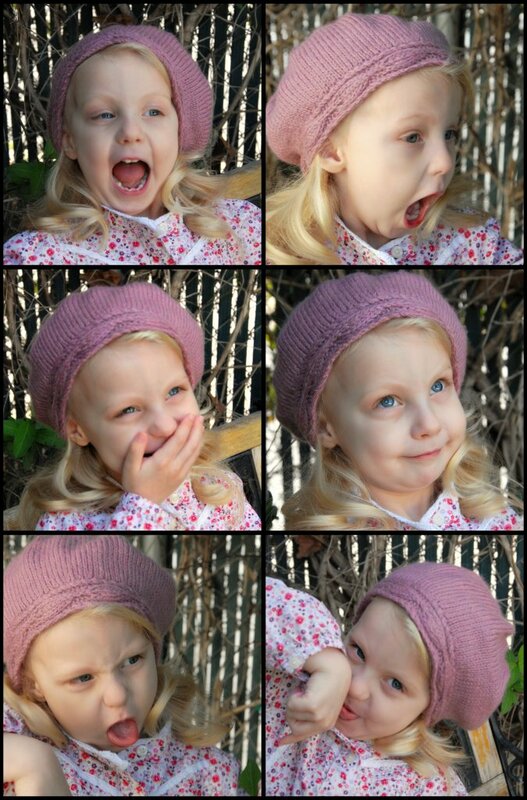 the goofier my 4 year old gets during our photoshoots. or if she ever has a boyfriend that I don't like. 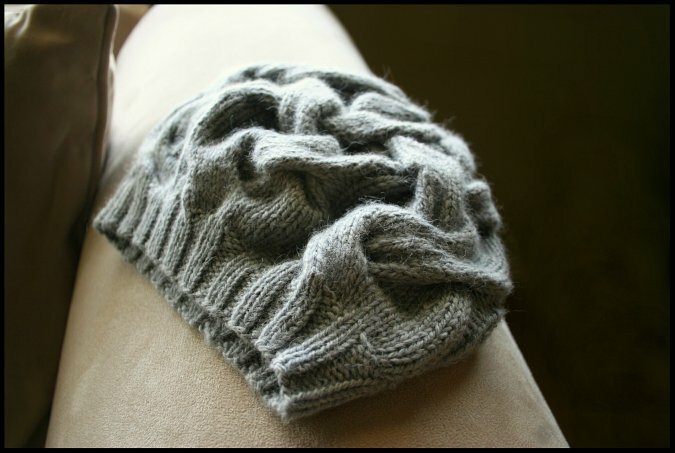 I just had the pleasure of knitting the 16 cable beret by Circe Belles Boucles. The pattern is simple, quick and not fussy at all.. There are only 4 cable crosses in the whole hat! I love these how these over sized dramatic cables look.. I made a few minor modifications to my version. I made the largest slouchiest version and added one extra cable cross before decreasing. I just felt that it should be there. Also I eliminated some of the plain knit rounds in the decrease portion. Its so soft and cushy and WARM. The lovely yarn I have to thank for making this hat possible is Louisa Harding Thistle. 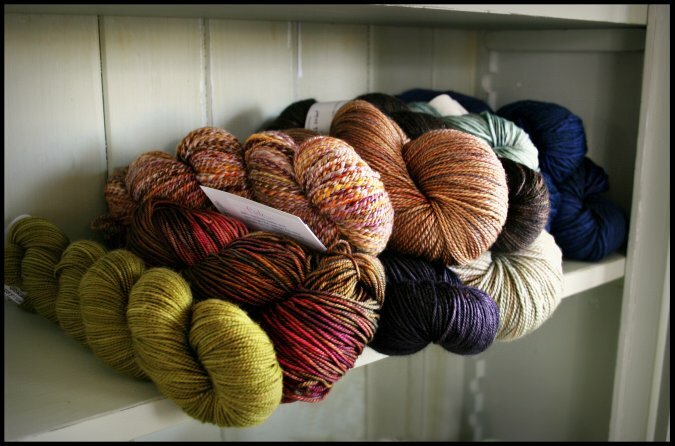 It offers a truly decadent knitting experience. you could definitely squeeze this pattern out of 2. I just barely had to dip into that 3rd ball of yarn. 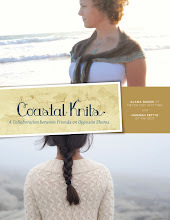 how to enter to win both yarn and pattern! 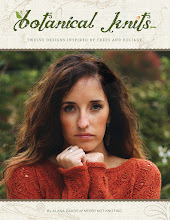 Get 20% off all Louisa Harding yarns at Loops by entering the code "NNK" in the checkout process! Download the Mp3 for Episode 32 here. So I went up to Stitches West a few weeks ago or so. 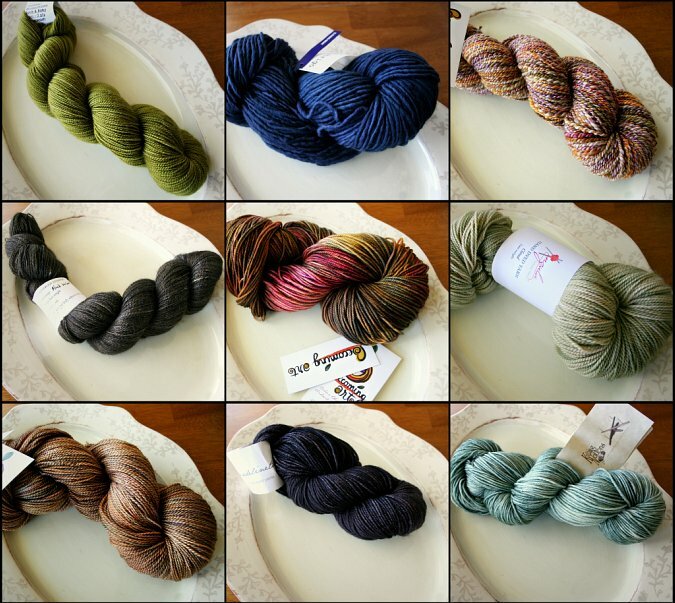 I am in love with all of my new yarns. I have no idea when I'll get the chance to knit all of them.. but for now I am greatly enjoying just having them in my possession. Each picture links to the vendor from which I bought from. about my trip to Stitches West! two more RoseKnits bags into my knitting bag family. I just love the size of this 'Cube' project bag! 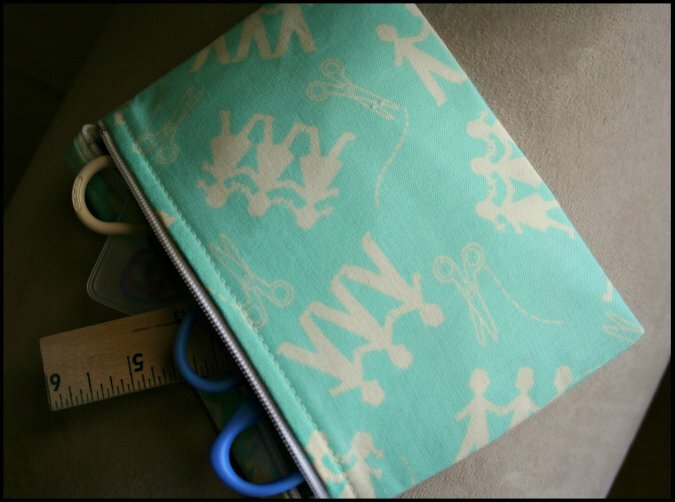 Its perfect for a sock or hat project and the little notions pouch fits inside perfectly! And.. aren't these fabrics just the cutest? I've been working on 2 new hat projects recently, so I've been using this little project bag a lot. Dpns, measuring device, cable needle, stitch markers and scissors. It was great having all of those things in one place with my knitting..
and in a matching bag too. Just love that! I hope to adopt more in the future. 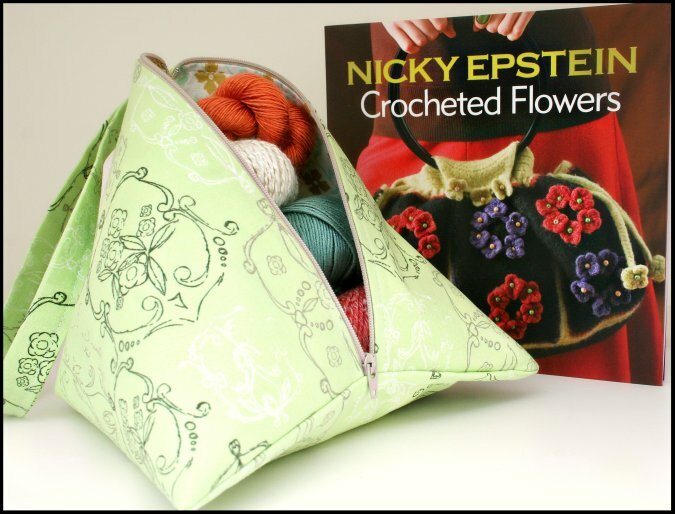 Get ready for Springtime knitting with this lovely, yarn-filled "Fortune Cookie" style bag by RoseKnits and this brand new copy of Nicky Epstein's Crocheted Flowers . 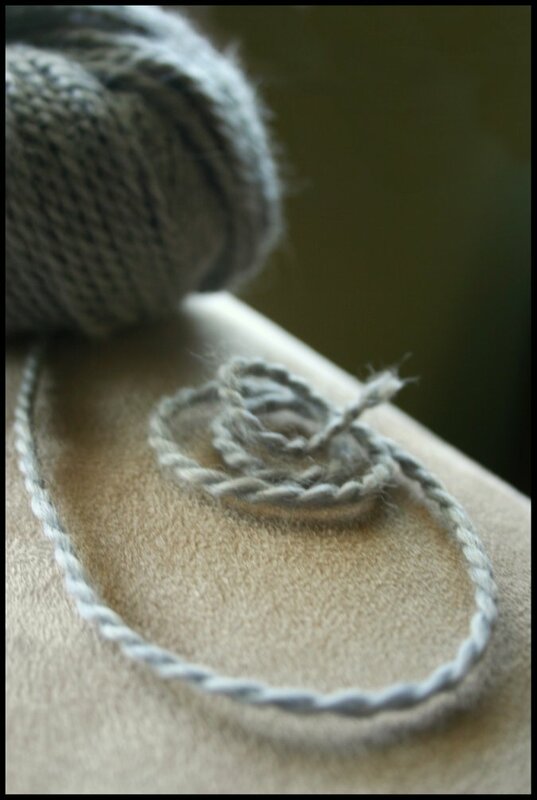 you don't have to worry about your yarn rolling all over the floor. 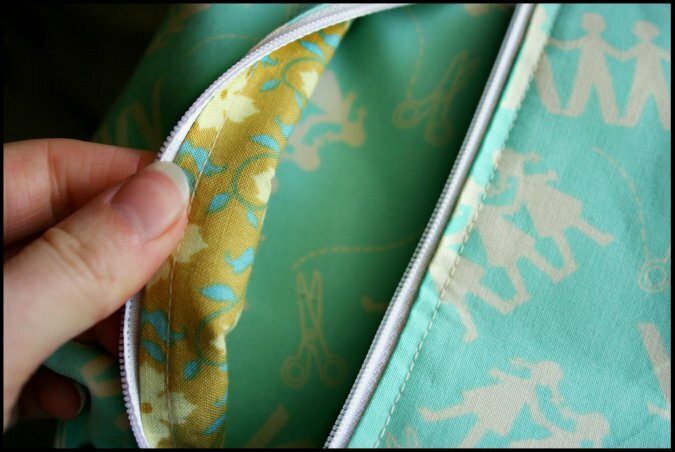 This bag is also very roomy and can easily hold a small to medium size project. 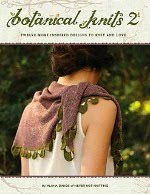 With this giveaway you will also have the chance to win this lovely book by Nicky Epstein. Crocheted flowers are perfect for adorning your Springtime knitting projects. 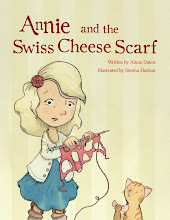 Look at all of the pretty flower patterns found in this book! comment under this blog post with some contact information.
" 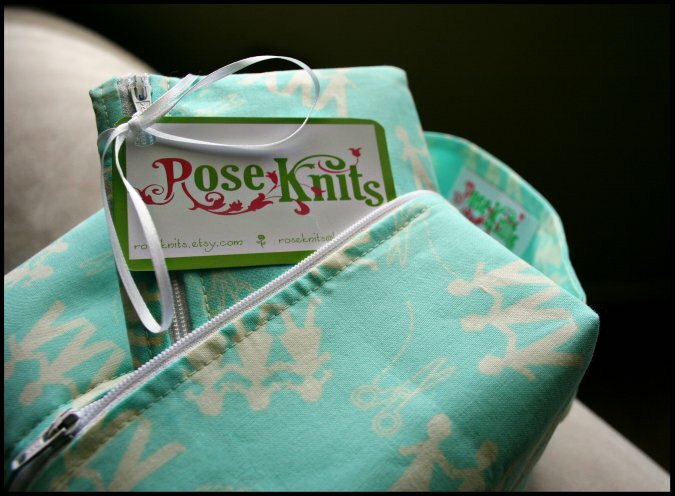 I entered the RoseKnits Springtime Drawing Giveaway on nevernotknitting.com! You should enter too! @nevernotknittin "
There will be only one winner selected at random. The winner will be announced March 15th, so please check back then! The winner is Jen G.! Congratulations! Check back soon for a chance to win your very own Roseknits bag filled with goodies and a copy of Nicky Epstein's book Crocheted Flowers! Download the Mp3 for Episode 31 here.